This is something to consider if considering external heating of materials, whether on Mars or Pluto, Titan, or other icy bodies. Another curiosity movie for consideration. This is at Earth temperature, pressure and air content type chemistry. Mars, Pluto, Titan, and other locations would all be unique perhaps. Earth lava poured onto a sheet of water ice. Observing the overhead look at Sputnik Planum, in an enlarged view of the map of informal names does not seem to show any evidence of erosion or liquid flow, There is no excess darkening of the background on the south side of the bright core of the ringed feature in this image view. In the image the south is on the left side of the bright point. This is probably the source image for the flyover oblique view. The rings around the bright elevated object are nearly equally toned except for a few trench depressions which are darker. The loss of textural character on the left or south side does not occur in this enlarge view I have prepared. I see no evidence of liquid, either light or dark flows, nor a direct shading from a gas release. There is a series of layers or steps in varied bright and darker tones showing possible flows to the west and southwest. Those follow the half rings in the west(top in the current view) and may relate to the very bright ridge-like shape which extends further west to the image margin(again the top of the view here). Other versions of this area show far more darkening behind the bright 'knob' shape, especially in the flyover sequence. It was fortunate that this map was issued with the informal names for the largest features. As this map was a large file, and as it should remain as a single image, I believe it is wrong to crop a portion of the product. Limits in the files I can upload to a host prevent the very educational enlarged single full frame view here. It runs between 60 and 160 MB in size. Even a JPG is about 20 MB. In viewing this 3X size Sputnik Planum view, you should be able to enlarge this in your browser to 2x or 3x with little distortion. The JPG linked here may degrade over time, and I can provide a replacement, but we should have high detail originals from the mission by that timing. This is a dpi of 2343. Some of the textures seen may be artifacts, but the lumpy shaping is consistent all around the bright 'knob'. The scene to me still appears probable as a source of material added recently, with the lobes of south and westward direction. I see no strong wind blown debris apparent in the cropped portion of the image. Informal Names for Sputnik Planum image page. Some evidence of wind tails are seen in the central to eastern section of the composite full frame image when the image is enlarged and altered. A few of those were enlarged by mission researchers and released to the media. I did not see the enlarged views in the gallery. The dark wind tails extend to the east. A popular journal release suggesting the source of nitrogen, ice and gas, is internal and caused by tectonic or other processes below the surface. Both location and eruption can be attributed to a single system, possibly. Ref., images of reply #7,10, & 16. There are many secondary images now floating around at varied degrees of detail loss for the Pluto source images. Apparently some of the images were released only to media or 'aquaintances' and this is an example of a secondary as a alteration, original as a JPG. The insert is a 3X enlargement, at 32 tones, considerably altered. Again, as in previous versions, the rings are missing on the lower side in a possible flow or air passage haze of similar tones to the darker trough materials. As the actual originals and best detail source images are not yet offered here, I cannot do more with identification of possible liquid, ice, or solid flow path. There is a possibility that this is a gas release, and multiple images over time would aid in eliminating that possibility. credit: NASA / Johns Hopkins University Applied Physics Laboratory / Southwest Research Institute. A smaller view, same image. The details from various images builds some confidence that a 'downhill' flow or drift has obscured the wall of the rings, or at some time erosion has been involved cutting the ring wall. Some other bright knobs or mounds in the area show a single bright ring type effect, but this is the most obvious multi-ringed bright knob. The rings are one to three miles in diameter. The feature is larger than Diablo crater in Arizona. The inner ring would be larger than Barringer crater in Arizona. The outer rings would be double to triple this size. The apparent third vague ring would be probably four times this diameter. credits on image. source, Google images, Barringer crater search. The bright central knob and rings do not appear as a deep crater, but as a ringed surface feature with some elevation of the central knob or dome. Erosion or lack of a southern ring wall section is a substantial action at some timing. It is important to take a perspective of open mindedness in interpreting the results of missions such as New Horizons Pluto system flyby. The massive efforts of seismic interpretation of Earth processes such as the Hawaii island series, and the Yellowstone linear sequence, are the best we can produce the current techniques, yet the results are not convincing to many geologists in a single pattern match to data. The Mars INSIGHT mission and the New Horizons Pluto efforts will not give a simple story-line and many missions will be required to build an understanding based upon data returned. The deep mantle plume explanation for the two locations on Earth is still under debate and study despite great efforts at the most convenient circumstance we have available to study deep processes. If we look at this anigif of the Earths gravity stress patterns over the years, and compare this to the obvious geological features of Pluto, we could have taken the figures from either planetary body and applied the pattern to the other planetary with confidence. I'll find source references for the anigif of satellite data for Earth. Looking at this anigif of a polar view of Mars, from several satellite data sets, we could also apply the alternating high versus low linear tending pattern to the planet Pluto without raising eyebrows about whether one planet was measured or the other. The similarities of the gravity patterns observed follow the landform features of much of Pluto, even Charon in some basics. Perhaps some day we can apply actual measurement imaging for Pluto to confirm this apparent match of geology and satellite data between the many planets. This one image over the several years of Earth satellite data showed a once only over many years occurrence of a strong alignment of the East African Rift Valley geology feature with a massive satellite measurement of gravity stress offset, which has no other visible appearance in the monthly averaged data set. Perhaps we will find this type of satellite information for Pluto as well, along the margin of the bright ice formation where clear tectonic activity has been creating features in a linear series of patterns. This particular image was one of the few that showed a pole to pole high and low linearity of the gravity patterns, whereas the norm is for a pole to equatorial region high to be offset with a corresponding low linear measurement on the opposing hemisphere. The strong feature on Pluto carries the visual geology beyond the equatorial region towards the opposing pole similarly. Using the GRACE satellite data to show a corresponding gravity pattern in one year, to subsequent weekly accumulated totals for Earthquakes occurring in other years, a precise match of basic data to earthquakes is obvious on Earth. The tectonics active zones are patterned to the global gravity stress patterns in active areas, but the match is not yet mapped in tandem on a daily and weekly basis, in close timing. An expensive but valuable set of satellites could be used to target landing of spacecraft such as INSIGHT on Mars and future landers on Pluto to enhance the success of missions. This anigif is information for Earth only, but has possible value in interpreting Pluto geology. GRACE satellite data applied to Woltons EQ3d earthquake mapping totals. New images are promised on Sept 11, 2015 now, a day late, and these differing perspective views show the active motion of material is from both directions over time, inward to the ice bright core, and out at times, to the margins of the dark rimmed trough zones on the Northwestern area of the current bright zone. A few craters along the North and Western margin appear quite dry, empty, and very deep possibly. Is that an illusion of depth? 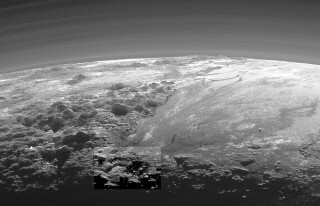 The bright area has migrated and varied over time, possibly similar to the animated GIF patterns I selected as possibilities of recorded movement, and deep erosion or segregation movement of material, additional to what is estimated to have left Pluto is clearly in the visual landform record. Unfortunately I need closeups of the Northwest margin, and they are not showing as yet. Are we going to be seeing detailed closeups or are these perspective views our best record of the smaller features of bright ice knobs and a better view of the ringed elevated feature I was studying as a source of bright material? Will we be able to see possible flowing or erupting materials at close range? The ringed feature I was studying has a probable landslide or flow erosion downslope section removed from the inner ring, and the area to be studied is a two mile diameter feature. Surely we will be able to see that one bright knob or dome with rings, even if the two dozen or more similar features across Sputnik Planum are not seen as well. The newer September 11, 2015 images promised are not detailed closeups, but are spectacular views and perspectives of the surface erosion and active landscape around the bright 'heart' area of Pluto. I included a closeup insert showing crater wall breaching on the right side for two large craters, which have well defined walls all around the remaining circumference of each. Drainage and erosion, not glacial erosion only on these two and many more in the larger scene. Definite unexplained liquid/semi-liquid breakdown in addition to tectonic faulting breaching the walls of steep crater rims in limited sections. Stepped erosion removal towards the bright ice core area of Sputnik Planum, not unlike a planet with weather and liquid precipitation or groundwater flooding and flow downslopes. Not the Pluto we are being given in the media reportage from description based upon current conditions and expectations of small diameter, low gravity, and a lack of atmosphere density. Unfortunately I had enlarged the flat overhead insert view to 2X, but the image host 'auto-reduced' the size, so the view is undetermined and intermediary in size. A JPG, so save at 100% quality if collecting these images. The originals are slightly blurry. It may be the 31,000 MPH spacecraft speed, or the low light from 3 billion miles distance. The original flat insert view, at 2X size of the original, cropped to show the crater wall breaching in only the downslope sections. Curious how this does not resemble glacial flows completely, and shows no inclination of downslope glacial flow anywhere. The flows look like runoff and liquid erosion seepage of a dense groundwater or melting ice based ground cover to a liquid type condition. Many tectonic adjustments and stimulation of the erosion process. That is the process of ocean and sea/lake formation on Earth. The deep crater on the low left side has a pronounced tectonic type wall breach with removal and the two layered very deep bright surface layer is evident as much thicker on the left or Western side. Is ice melt and runoff/seepage or glacial solid flow evidenced? Where are the 'landslide' toes, deltas, debris, transport chains of dunes or channel fill? No solids to account for glacial mass in motion. Possibly just a matter of scale in viewing? Downslope sublimation? Explanations and better views are needed. It seems appropriate to show the areas studied by the polar and latitude/longitude grid orientation, a view I have not included. It helps in mapping landmarks while viewing small areas. From the image collection to date. The July 24, 2015 'Press Conference','slide 2' image by Cathy Olkin. Currently on page2, of 165 images to date. Hopefully more soon. This seemed to add drama to required explanations. 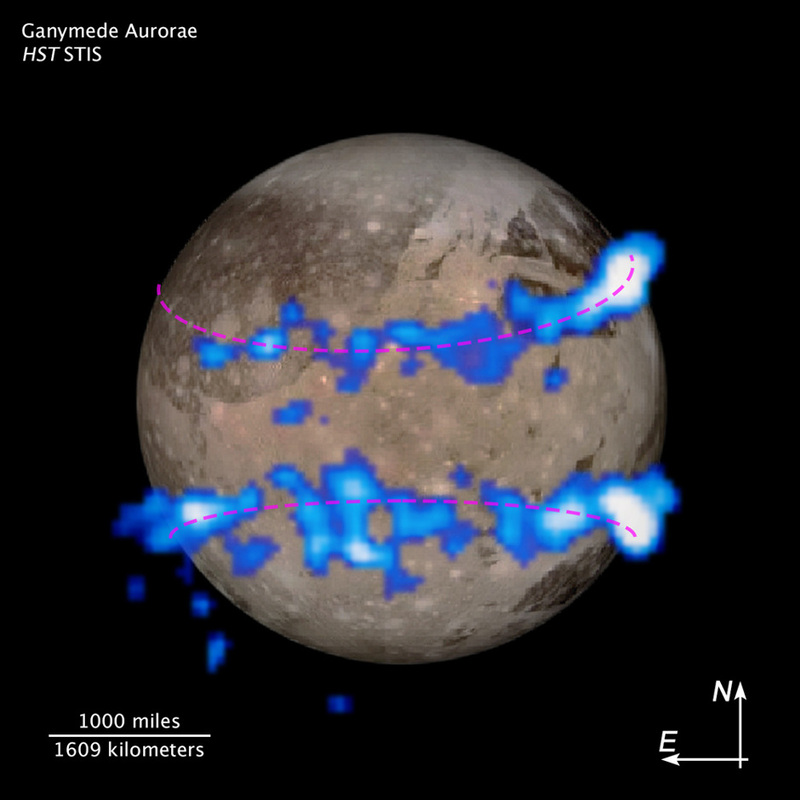 In casual thinking about the Pluto/Charon locked binary spin, is the view of Ganymede with the aurora matched to the bright and dark linear patches arranged above and below the equator a possible indication of a fixed heavy concentration of or ionic charged standing wave or resonance pattern a cause for the multiple bright patches across the dark band of the near side of Pluto? Tectonic compression or isostatic opposition/compensation to the semi-fluid ices of the far side was my obvious thought, but with so much talk of charged subsurface 'oceans' and salty seas carrying charges, and with Mars so obviously showing periodicities in landform patterns in banded repeats along the longitudinal direction at stepped offsets in latitude, a dry or 'wet' chemistry carries a potential for pattern repetition for a variety of reasons or causes. Some professional conversations must have resolved some of the presumption in a best estimate by now. New images released this week, September 13-19, 2015. Below are altered views, full sizes available at the download button. Originals show the full tonal range as landscapes, but these concentrate on geology at the close range and dark areas. These as JPG altered images may not last and carry the full original information through transfers, but they give the best shadow detail I can provide thus far from the originals issued this week from the New Horizons website gallery. There is a 'download' button at the lower far right corner next to the 'Share' button and icon listing. One is 3.8MB and the other 3.2MB. I find it helpful to view the near side slopes of these 'mountains' presumed to be ice or mixed chemistry. Near the bottom center of the ice plains is a coalescence spot of a series of rounded and stepped 'sink hole' type shapes, possibly a source of the ices and liquids or gases at some timing. Currently the seems to be a depression where the dark and bright lowest ice pond in the circular recesses. Redundant description perhaps, but if the flow is downslope, and coalescence occurs in a small area, the location is significant in the Pluto geology at the spot. NASA / Johns Hopkins University Applied Physics Laboratory / Southwest Research Institute. My images as usual are not copyrighted except for an acknowledgement by name requested, and these are JPG which degrade in repeated transfers. Is this a source of ices, gases, and liquids, or a sink hole, or, just a series of craters? Clearly the ice appears to flow into the depressions currently. In explanation for the blank and missing images of several posts on this topic, I can only give a historical perspective. Imageshack.us used to refuse to allow direct payments, 'lose' a large percentage of the listed photos stored, and send emails demanding payments to cover the 'late payments' they were demanding but refusing to receive. I was repeatedly offered renewed membership in the same name, and upon reregistering, found that my money was not recorded as current payments, but was a parallel set of accounts, a multiple number in the same name, which I thought was not possible. My complaints led to a renewed account with the old images listed, no new account in my same name, but the records of payment were not being credited to my account. I then received a series of email demands for additional late payment compensation, for the same account name, and resent additional payments for the same account whereby the payments led nowhere, and a week or two later I was receiving additional emails demanding payments to 'Imageshack.us' for the same account. I paid about four hundred dollars for the account to be continued in six or seven payments, and was rewarded with a single sign-in potential for the account of a single name and photo listing. At the end of the series of payments I finally received a single response from multiple complaints about this, and in response to my complaints of parallel account payments maintained against my own name, found a refund I had requested for about two hundred fifty dollars, about half what was due to me over a four month period. I had paid about five hundred dollars to the same account name, and was still listed as deficient. That was about 2011. I still had no allowance for making direct payments on the account, and later had to make emergency payments for a few years, with announced promises of a deletion of the account. The matter was always peculiarly wrapped around the demand from Imageshack.us that I pay with old expired card numbers, for an account without any telephone support interaction allowance, no responses to my complaints, and no returns of my phone numbers offered, and additionally no allowance of a mailing address for resolution of the matter. At one point, they added a new card number. The problem subsided over time of several years but was never resolved informationally with an explanation. No phone number now is allowed for 'members'. Any problems are never answered but only a 'outcall by message' indirect communication system existed. They now have a web address in the Imageshack name, but it is attached to a system with no other than an e-message system of one way only writing. After more than ten years I do not have any telephone nor mailing address communications as yet with them. Offering payments in desperation to the 'one way only' outcall group by giving card numbers in response to disappearing image listings, without any responding messages from the outcall group was working but did not result in payment records on a account single record accessible to myself. I have paid for what was promised as a 'free forever system of web photo hosting' initially, up to a hundred dollars or more per year on average. The web site was down again this week for a period of days, and I read rumors online of a 'power system' damage being repaired. It may happen they return online , but the hundreds of missing images which accrued over ten years are apparently not going to be ever recovered as is promised in the FAQ pages written promises. If you fail in using expired card numbers to pay Imageshack.us, they simply promise to delete all images despite the promise of 'free hosting'. Once they stop an account, they will not allow any complaint or request for logging in to allow changes of payment, nor will they allow resolution of any complaints to the complaint department. They currently name the complaint resolution group 'zendesk' within the web site name Imageshack. They disallow all communication with the complaint group, if the account is not functioning properly. The account controls all the access to complaint. If they use the parallel accounts extortion technique as in the past, they now seem to not allow any payments at all. It is without resolution allowance. As they have grown to the fourth or fifth largest image hosting website name over ten or twelve years, they have become far more expensive and far less amenable to problem resolution. They had a phone number hidden in indirect linked pages 10-7 years past. Now they do not even respond. That has been the standard of bad consumer interaction over the past six years or so. I am trying to resolve the new episode of massive account denials and chaotic image disappearances that is affecting millions of persons all over the world this time. I have read current stories of a new demand that all persons trying to look at the 'hosted' images being required to register as new members to look at and download my and other account photos. They now also demand cash payment for new accounts, while promising a 'free hosting' service which is unlimited in numbers. The new services are being 'rented' at $30 to $99 per month for the original promise of a free hosting. It's the common tactic scaled to one of the most expensive and perpetually unreliable hosting services I have ever read complaints about. As yet, I have to recollect the point at which they dropped the promise of 'full size and resolution' image hosting to about a 70% quality drop-down upon uploading, with a diminished size of view. That was about the timing of the parallel illegal payment demands. Apparently problems in expansion have plagued their system, as could be expected. Due to the disallowance of all communication, I have no idea if the matter will be solved this time. I am reading in consumer blogs an expanded series of complaints by persons from Japan to Europe, and it seems to be affecting my account(s) also. I paid just this month again. Now I cannot get access to any phone, or written address for messages again. It's a shame that science has to take a back seat to money hand in fist, and even that does not solve the mystery as to where parallel accounts are existing on the software and accounting. I will try further to communicate, but the history is of one-way-only messaging. A service black-hole right here on Earth. If I had to double pay, I would be tolerant of the problem as I was in the past, but I have none of the information I need to deal with the matter of Imageshack.us. And you might like to buy the website for reclamation work. I don't how much they might want, but they know how to make money. In the matter of the possible sinkhole to a lower strata of ice storage, I am working on an image, but the location is right at the terminator of long term darkness, and as best I can see in dark image detail there is no further transport of the ice flows other than the coalescing drainage into the small depression I have altered and marked. There is a possibility that ice is 'stacking' to ordered appearing mountainous mounds. The darkness seems to be measured as a zone of methane ice predominately. I'll work with a new image host presenting the evidence in new releases. Back to work after a recovery of images. National Geographic is now showing news of ice volcanoes as new information based upon NASA decision to accept the images content after a wait of 4 months. The features I presented upon release in July and after and claimed were obvious eruption, spreading fissures, and rotation areas, are now guardedly offered as possible volcano items. No explanation for the faulting, matches to Earths mid-ocean ridges, nor any discussions of offsets where the rotational characteristics are seen. Eventually NASA may want to wade into the descriptive analysis of these details, but they are waiting for an additional period of time to mull it over. The theft of my laptop and other electronics items has slowed me considerably, and the temporary loss of the entire account at the image hosts was a setback. Hope to proceed now once again. The 'sink-hole' on Pluto is still not announced after four months of looking at the images. They will find it eventually. Thanks for your patience. Please return my laptop, tablet, flash drives, and legal papers.